Do you have a Georgia Lou Studios Blogger template and a mysteriously missing slider? This problem first surfaced in October 2016, but my teaching blog slider didn’t go missing until July. I’ve been getting lots of emails about this, so thought I would share a quick tutorial. You’ll need the code from Georgia Lou Studios Help Page, and less than two minutes to watch this tutorial. Tired of those sad Blogger sidebar labels? Are you ready to make your labels a stand out on your sidebar? Georgia Lou Studios shared this AMAZING tutorial with several options for styling your sidebar labels on Blogger. The instructions are spot on, BUT if you are not familiar with Font Awesome or playing with code makes you nervous, more support is never a bad thing. Below you’ll find a series of videos to walk you through getting your labels ready, grabbing your colors, and adding the code to your site for four different styles. You know how you have that one drawer in your kitchen that is the junk drawer? There’s some super important stuff in there, but it’s buried beneath tidbits of trash, expired coupons, and random bits of nonsense? And then every once in awhile, you’ve had enough. You clean it up, organize, and get it looking good. It’s time to clean up your blog’s junk drawer aka the sidebar. Here are five tips for cleaning it up and making the most of that real estate. This is SUPER simple and should take you less than two minutes. You should have no more than 20 labels on your sidebar, and even that is pushing it. In Blogger, go to Layout–>Labels to edit. Change from show “All Labels” to “Select Labels”. Once you select the labels you would like shown on the sidebar, click save, and you’re done! •Bloglist feeds for other sites. •The Blogger followers gadget. That doesn’t even work anymore unless you have a Blogger site. •Google+ button. If you have anyone on your site that actually wants to use Google+, they’ll find you. I know, I know. It’s such a nice thing to do. But there are only so many things you can have on your sidebar before your readers eyes glaze over. What they do see needs to be related to your site. You may love a blog or website, but if it’s taking readers outside of your own site, you’re hurting your traffic and distracting your reader from your own content. Is your sidebar longer than your post feed? Unless you have a brand new blog, your sidebar should not be longer than your post area. That’s a clear sign you’ve got too much happening on your sidebar. Now that you’ve gotten the nonsense off your sidebar, it’s time to think about what really should be there. What are your top priorities? Probably to help your reader find content, sign up for your email list (if you have one), stay connected with you on social media, and promote your store. Those priorities get lost when your sidebar is an endless scroll of information. Decide your priorities and make sure that is clearly and simply visible. Step up your Blogger game by .com-ing yourself, also known as redirecting your domain. You absolutely can purchase your domain through Google. It’s pretty easy too. For the majority of people, that should work just fine. If you ever think you may want to switch to WordPress though, it can get a little sticky to make the switch later. This tutorial takes your through the steps using GoDaddy. There are other places you can purchase from. This is the host I’m familiar with and many people use. You want to redirect your domain instead of mask/forward it. What’s the difference? Say your address is www.mycuteclassroom.blogspot.com, and you purchased the www.mycuteclassroom.com domain. •With forwarding, typing in either of those addresses brings you to the blogspot.com address. •With a redirect, typing in either of those addresses brings you to the .com address. Bought a .com and not sure if your site is set up with a redirect or forward? Go to your blogger dashboard and click “View Blog”. Look at the address. If it says blogspot, you have forwarding set up. If it just says .com, you’re all set! First you need to purchase your domain on GoDaddy. The domain is cheap. They’ll stick you with a bunch of add ons. You do want the privacy add on. Otherwise, people can use this site to look up the name and address associated with the domain. All the information listed for my site is Go Daddy’s information. If I had not added the privacy protection, it would have my phone number, address, and email address listed. Yikes. **The second row of information is specific to each blog. I blocked out the actual information from this blog and replaced it with a similar looking but made up sequence. You’ve got an error, but no worries. We needed that second row of information for our Go Daddy work. **You can add privacy from here if your need to. Once you click on Manage DNS, you will be at your Records page. You’ll need those two pieces of information from Blogger. **TTL is the amount of time it will take to go live. I select custom and change it to 600 seconds for everything I do. 10 minutes used to be one of the their dropdown options, and it now longer is, but I still change it to that. It may not even make a difference. **Don’t worry if you get an error message. Just hit refresh. It will be there. •Your will need to do this 4 separate times. 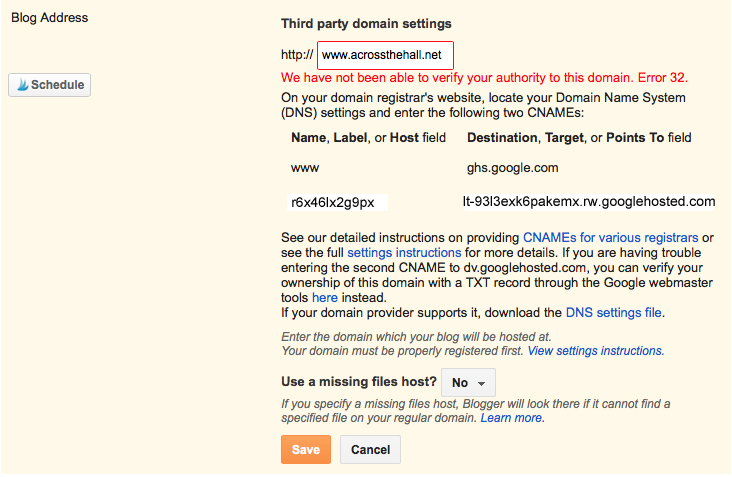 your domain with no www (ex: teaching superpower.com) as the Host. •You may get an error message. Sometimes I get it on all four, sometimes I don’t get it on any of them. If you get the error message, just hit refresh and your information will be there. **FYI-Check your link in Chrome first. It usually works immediately. Firefox usually takes 10 minutes or less, and Safari can take up to an hour. **If you have confirmed your site in Pinterest, you will need to reconfirm the .com site and revalidate your pins. You can read how to do that here. Blog designs, SEO, newsletters, improving your blog can quickly get overwhelming. Here are five things you can do to improve your Blogger site that will take five minutes or less each. Totally doable. Bonus points if you do all five. •Go to your Blogger dashboard and select Settings–>Other–>Google Analytics. Paste your code in and save! Blogger made a few changes that messed up the social shares widgets for people with modern templates from Georgia Lou Studios. The fix is super easy though. Head on over to her tutorial to get those social share buttons back in the correct spot.